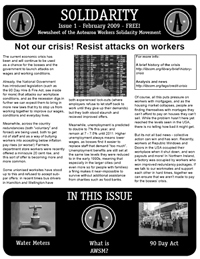 The first issue of Solidarity, free monthly newssheet of the Aotearoa Workers Solidarity Movement (AWSM). This issue has a special feature on water issues across Aotearoa / New Zealand. Download the .pdf below (617KB), or visit the AWSM website to read the contents online. * Water meters for Wellington? * Say NO to the 90 Day Hire & Fire Act!